Manor Entrance Gate - Blamphayne Sawmills Ltd. 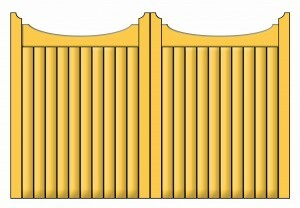 Very similar to the Windsor Gate but with a strong, swept top rail. A rebated frame with TGV cladding makes this a bold, strong entrance gate. Available in Iroko hardwood, or pressure treated softwood.